A Boeing 737 leased by Cuba's national airline went down in a yucca field. Only three or four survived, state media said. More than 100 people were killed Friday when a commercial airliner crashed shortly after takeoff from Cuba's main airport near Havana, Cuban state-run media said. The Boeing 737, rented by Cubana de Aviación, the Cuban national airline, had 111 people on board, including six crew members and a baby, Cuban TV said. A witness told NBC News that three people were pulled alive from the wreckage and transported out, and a Cuban television outlet reported at least four survivors. State media reported that the survivors were in critical condition. The state newspaper Granma reported that all but five of the 105 passengers were Cuban. Argentina said two of its citizens were among the dead. A U.S. State Department official said the department was not aware of any U.S. citizens on board. The accident occurred at 12:08 p.m. ET, José Ramón Cabañas, the Cuban ambassador to the U.S., said on Twitter. After takeoff, the aircraft "rushed ashore" in an unpopulated area between the Boyeros and San Antonio de las Vegas areas of Havana, he tweeted. 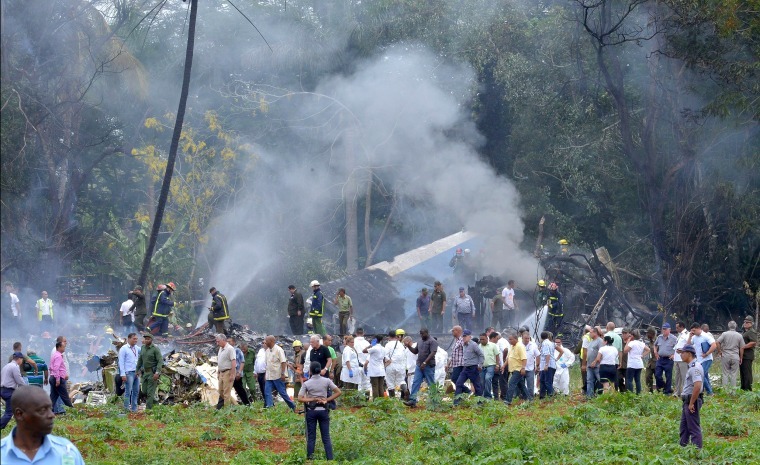 "It's an unfortunate aviation accident and we have to expect the news not to be good because there are deaths," President Miguel Díaz-Canel Bermúdez, who took office last month, told reporters at the crash scene. "Everything here has been organized, the fire was extinguished, the remains are being identified, a commission has been organized by the Transportation Ministry to investigate it." The wreckage landed in a large yucca field that is part of a government-owned farm. Photos from the scene show thick smoke billowing into the air, and firefighters and rescue crews attending to the crash site. The Boeing 737, built in 1979, was headed for the eastern Cuban city of Holguín, according to Prensa Latina, a Cuban state-run news agency. Cuban authorities said Cubana leased the airplane from Global Air, part of Aerolíneas Damojh, a Mexican airline out of Guadalajara. Officials from Mexico's federal transportation department identified the pilot, co-pilot, first officer and flight attendants as Mexican citizens. Relatives of passengers rushed to the scene. Among them was a man who told The Associated Press that his wife and niece had been on board. He declined to provide his full name before he was taken to an airline terminal where relatives were being asked to congregate. Cubana has taken many of its aging planes out of service in recent months due to mechanical problems. Cuba's first vice president, Salvador Valdés Mesa, met Thursday with Cubana officials to discuss improvements in its heavily criticized service. The airline is well-known among Cubans for its frequent delays and cancellations, which Cubana blames on a lack of parts and airplanes due to the U.S. trade embargo on the island. The crash Friday was Cuba's third major fatal accident since 2010. Cubana de Aviacion has suffered a string of fatal crashes since the 1970s. Last year, a Cuban military plane crashed into a hillside in the western province of Artemisa, killing eight troops on board. In November 2010, an AeroCaribbean flight from Santiago de Cuba to Havana went down in bad weather as it flew over central Cuba, killing all 68 people aboard, including 28 foreigners, in what was Cuba's worst air disaster in more than two decades. The last Cubana accident appears to have been on Sept. 4, 1989, when a chartered Cubana plane flying from Havana to Milan, Italy, went down shortly after takeoff, killing all 126 people on board, as well as at least two dozen on the ground. Cubana's director general, Capt. Hermes Hernández Dumas, told state media last month that Cubana's domestic flights had carried 11,700 more passengers than planned from January to April. It said that 64 percent of flights had taken off on time, up from 59 percent the previous year. "Among the difficulties created by the U.S. trade embargo is our inability to acquire latest-generation aircraft with technology capable of guaranteeing the stability of aerial operations," Hernández said. "Another factor is obtaining parts for Cubana's aircraft."